$64.95 This item is selling for $64.95 on eBay. 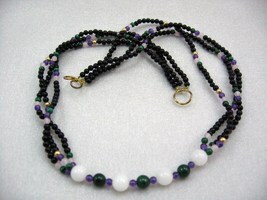 HANDCRAFT MIX GEMSTONES ONYX, AMETHYST JADE MALACHITE 3 IN ONE NECKLACE 22" L THIS IS VINTAGE STORE INVENTORY JEWELRY. 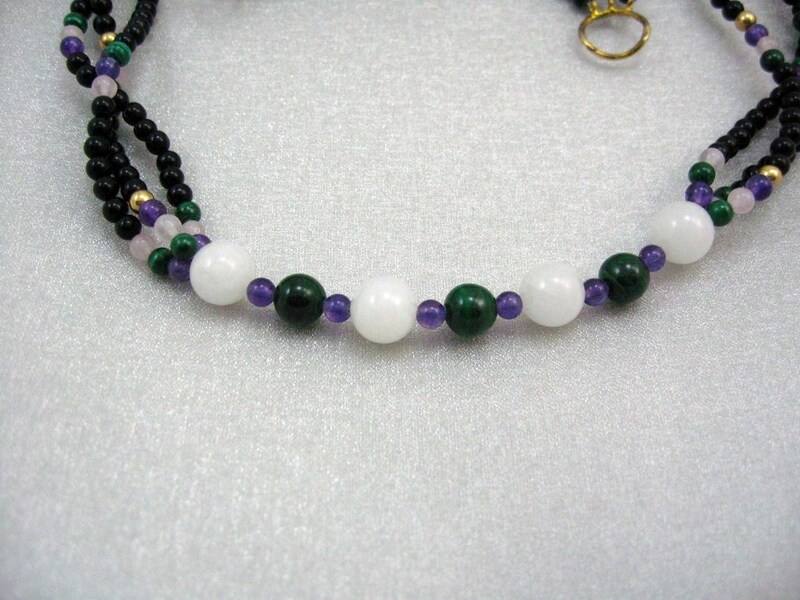 ONE OF A KIND- HANDCRAFT FILIGREE DESIGN GENUINE GEMSTONE NECKLACE. ACCENTED WITH 3 STANDS BLACK JADE/ONYX 4mm BEADS, MALACHITE, AMETHYST AND ROSE QUARTZ BEADS.TECHNIQUE CREATED INTO ONE AWESOME NECKLACE, YOU CAN WEAR ON LOOSE STANDS OR TWISTED STYLE. 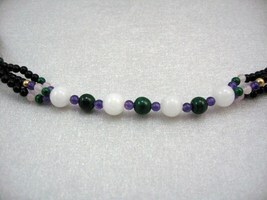 IT HAS 10mm WHITE JADE beads and 8mm Malachite beads Decorated the front part of the necklace as pendant. Necklace length approx 22" long with 925 antique gold secure latch closure clasp. 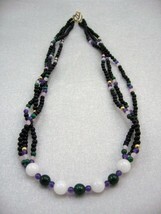 CONDITION: excellen, STYLE: crative 3 stands into one necklace STONE: multi. gemstone beads size are from 3mm to 10 mm. MATEL: 14k gold beads and 925 gold closure clasp I HAVE SOME MORE HANDCRAFT GEMSTONE NECKLACES EARRINGS ARE SELLING IN MY STORE. PLEASE CHECK IT OUT! MANY THANKS FOR LOOKING!